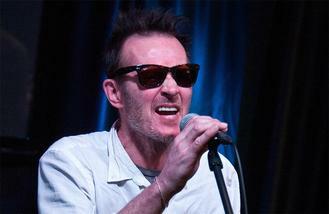 Scott Weiland was laid to rest at the Los Angeles Hollywood Forever Cemetery on Thursday (10.12.15). Members of Velvet Revolver and Stone Temple Pilots paid respect to their former bandmate, who passed away in his sleep aged 48 on December 3. Chris Kushner - the wife of Velvet Revolver guitarist Dave Kushner -took to social media along with many other stars to pay tribute to the departed rock god. In a post remembering Weiland on Instagram, she said: "A very sad day when [you] bury a friend. He was a good man. Don't believe everything [you] read. Remember, we were all there. (sic)"
She described the funeral as being "filled [with] love and funny beautiful stories about Scott (sic)". Many other stars have remembered Weiland, who leaves behind two children, Noah, 15, and Lucy, 13, and his wife Jamie Wachtel. Motley Crue's Nikki Sixx tweeted: "Sad to hear about Scott's passing .I hope it wasn't drugs. The saddest part of the story is his kids and family being left behind. RIP (sic)"
Former Nirvana bassist Krist Novoselic wrote: "Really sorry to hear about Scott Weiland. (sic)"
And Blink 182's Travis Barker tweeted: "Very sad news, rest in peace #ScottWeiland #toosoon (sic)"
David Guetta wants to get one million fans to sing on his UEFA EURO 2016 song 'This Ones For You'. The Weeknd sued for allegedly sampling the bassline for 'The Hills' from obscure film soundtrack. Taylor Swift celebrated her 26th birthday with the announcement of her concert film. One Direction were surprised with a video tribute from their famous pals on 'The X Factor' on Sunday (13.12.15). Kanye West has warned people not to bother him while he's finishing his new album. Perrie Edwards has praised her Little Mix bandmates for helping her get through her split with Zayn Malik. B.B. King's family and friends honoured the late blues legend by laying a stone in Mississippi. Taylor Swift fans are being given the opportunity to contribute to a new book about the American superstar. Rita Ora "used to be obsessed" with Googling herself.